There is a new kind of art form that anyone can create in outdoors especially around the Ozark Mountain. This new contemporary art form that has emerged using natural materials is called collaboration with nature. Anyone who has made snowman, artful arrangements made from leaves or flowers, or image drawn in the sand has collaborated with nature. The art that is created through the use of natural materials is called ephemeral art or transient art as it will last only for a short period of time like a few hours or days. Creating an art using materials found in outdoors is a unique outdoor fun activity which is affordable to everyone as it doesn’t need equipments or special things to create ephemeral art but your bare hand or with the use of stone or knife. Anyone who has experienced arranging a vase flowers has collaborated with nature and so every child who has made a ball toy out of palm or coconut tree. The natural materials are transformed by artists into a unique form of art that anyone can appreciate. Many of the artistic creations from around the world that are done through nature last for a lifetime such as carved stone, cast iron or bronze, and more. Many think of an art as making permanent objects. However, in our present time, many honored art that is brief-lived such as a singing performance, a ballet dance, dramatic act, or a band performance. But with the emergence of new technology, these performing arts can now be preserved in film or video and can be reviewed or seen anytime just like the nature art of carved images. Ephemeral art or transient art through nature collaborations are not intended to last and their decay or transformation is part of the collaboration. Collaborating with nature involves many styles. Every natural material should be arranged properly by the artist in a powerful way, this technique of arranging materials is called assemblage. The beauty and intricate look of every piece of nature must be envying before the intervention of an artist. The form of our nature is not always permanent because of the movement, growth, and decay. So nature is always in a state of change which is the key to understanding its transformation. Everything that forms the nature grows or decays. Every artist can enjoy the freedom of making an art with nature by just using his bare hand, a sharp stone, or even the thorns or the quill of a feather. Depending on the season, an artist can easily think of a nature art that he can easily make. If it’s snowing, he can work with snow by building a snowman or make a beautiful artful flower arrangements during spring time. During summer season, he can take a wonderful beach vacation and build a sand castle. 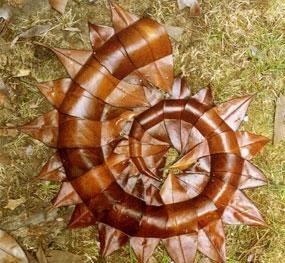 Making a beautiful nature art work with the use of natural materials is a unique outdoor fun activity that can let you create ephemeral art by way of collaborating with nature.